Today, SCHURTER's piezo switches are used in many applications, especially in harsh environments. The advantages of using a piezo switch are many, but one of the key benefits is their completely sealed surface, which can be activated by applying minimal force to signal actuation. These switches are now offered with a new multicolored illumination. The pulse derived from the force exerts pressure on the piezo element, thereby converting the physical pressure into an electrical potential. This pressure is sufficient to produce a clear, potential-free signal, which is possible with the employed semiconductor components. Because of the sealed surface, the product has IP69K seal and thus is absolutely impervious to leaks. Unlike pushbuttons with a mechanical stroke, no dirt can accumulate underneath or around the switch. This technology is ideal for hygiene related applications such as those in medical, the food processing sector and outdoor applications. The new multicolored illumination of the PSE series greatly expands its application range. 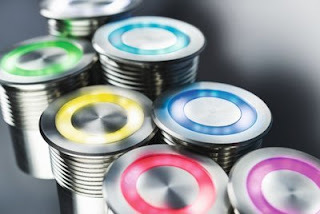 The round button style switch is available with 22 mm, 24 mm, 27 mm and 30 mm diameters. To make the integration into customer specific applications as easy as possible, the strands are color-coded in each of the illumination colors and are supplied with a voltage range of 5 to 28 VDC providing a brightness that remains constant in all applications. The standard version is offered in red, green, and blue. Additional color options include yellow, cyan, magenta and white, which can be made through additive color mixing. Upon customer request, the supply voltage as well as the internal resistors can be removed. This creates the opportunity to present a broad color spectrum, which requires the addition of a microcontroller in the application to control the LED's. In addition, there is the possibility of varying the brightness depending on the design, which allows dimming. The multicolored illumination also allows multicolored colored status indications. Today these are used in customer-specific applications, e.g. in locked access areas to laboratory rooms. With this traffic light display (red, green, yellow) it is intuitively understood if one can enter the laboratory, if the room is currently occupied or if the room is being cleaned. Thus the SCHURTER PSE switch becomes an interactive input element that, at the same time, is a status indicator via the ring illumination. The PSE series is available in several versions. These range from a "marine grade" stainless steel housing to anodized aluminum housings in various colors. As an alternative to the multicolored expansion, the PSE series is also available in the "EX" version with ATEX certification for applications in potentially explosive areas, which are used especially in environments with gases and flammable liquids, such as in the petrochemical/gas industry. Another specific version, "PSE HI", has an IK06 rating for applications at risk of vandalism, which, in combination with a piezo element, is the only one currently available on the market. In summary, the SCHURTER PSE metal line switch family is ideal for applications where hygiene, cleanability, visual feedback or use in a harsh environment are of key importance.